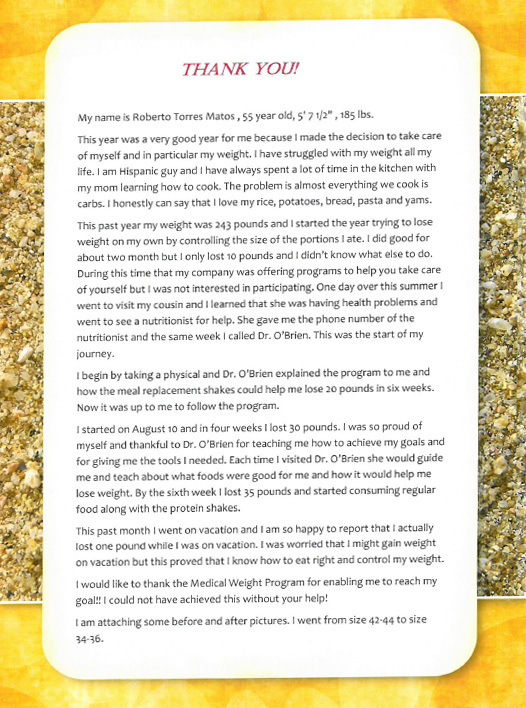 Read the Medical Weight Loss testimonials left by our customers about their experience while participating in our Doctor supervised medical weight loss programs. The Center for Medical Weight Loss worked wonders for me. I am a 29-year-old male who weighed 280lbs when I started. Over just 12 weeks, I saw myself completely transform. I couldn’t believe that even after the first week I saw a remarkable change. I lost over 10lbs the first week. I was very impressed that they can tell you how much of the weight loss was fat, muscle, or just water. They taught me how to stay disciplined with my eating and completely changed my bad habits. 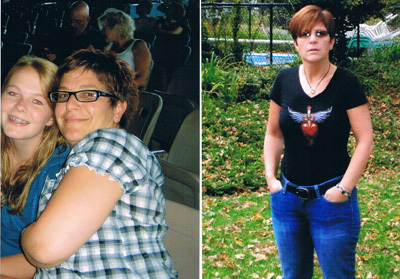 When I started, I was heading toward pre-diabetes. That is no longer the case. I started off exercising a couple times each week and was winded from it. Then after only a short time into the program, I noticed how much more I was able to do. By the end of my 12 weeks, I was regularly running 3-5 miles 4 days a week. I couldn’t remember the last time I even ran a mile before this program. I actually WANT to go to the gym because I enjoy it now. 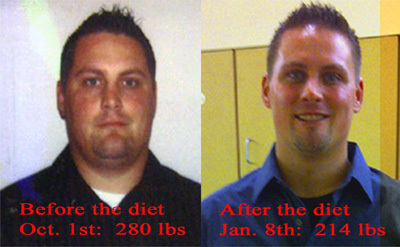 In the end, I lost 66lbs and weighed in at 214lbs. I also lost over 10 BMI points. I can’t believe how fast I was going through the notches on my belt. I actually had to poke new holes in my belt before I was able to go buy a new one. It’s amazing how great I feel now. I am a completely different person. I have been able to keep this weight off for a few months now, and I am excited to have this second chance. I fit into all of my old clothes, and I went out and bought a bunch of new clothes too. I am wearing sizes that I haven’t been able to fit into since high school over ten years ago. People I know can’t believe the way I look compared to how I looked before. The Center for Medical Weight Loss was well worth it, and I am very happy I decided to go to them. My story is no different than most patients at CMWL. Back in January of 2011, I came to terms with myself that I was overeating, but what I hadn’t realized at the time was why. After changing pant sizes 3-4 times I had had enough and like most people dealing with weight issues, I hated having my picture taken. My brother and uncle both joined the CMWL in 2010 and had great success, but what really encouraged me was my hairdresser. I knew she battled with her weight and 6 wks between haircuts she had lost 20 lbs. When I asked her what she had done she said she joined the CMWL. We talked about the program and I told her about my brother and uncle’s success when they were on it. I went home that day and talked with my husband and told him what I wanted – but mostly needed to do and he supported me 100%. I later called my brother to talk it over with him knowing he’d be understanding seeing he’d been through the program and could give me some advice. He reminded me the commitment that I would need to make if I wanted this to work. But mostly it would be a big change in my eating habit especially coming from an Italian family where we love our “pasta and bread”. I knew I had a challenge ahead of me but I was ready. I was so tired of being tired. I attended a seminar with the CMWL. The staff was great and understood what I was going through but most important what I needed. I knew I had gained weight but never really knew how bad it was until they told me that someone my age, height and weight that I was obesity. I couldn’t believe that I let myself get that heavy. When they received my lab work back from my physical my sugar was high. I could be borderline diabetic. Two words I never thought I would here. That was definitely what pushed me to start making changes. Coming from a family that has weight and health issues I knew that I would need to make the changes otherwise there may be no turning back. At first, I thought how am I going to do this. I knew that I needed to make a full commitment or it wouldn’t work. I spoke to my family and coworkers (seeing I am with them some days more than my family) about my plan to joining the CMWL and asked for their help and support and they were all willing to do wherever I needed. I knew that I needed to exercise (working for Physical Therapy) and with a treadmill and every workout DVD from TV, you can imagine I put together a program I knew I could stick too. My first week in I had lost 7lbs. As the weeks continued I stuck to the plan and began to increase my exercise. After completing my 12-week program I had lost 36 pounds and today I work out 4-5x’s a week cardio and 2-3x’s week strength training. I am currently working with the CMWL on a maintenance program. It’s nice to be able to touch base with them once a month. They helped realize my eating habits and the changes I needed to make and the reasons why I was overeating but mostly they helped me get back the person I want to be. I’ve gotten control back over myself and couldn’t be happier. Thanks to the staff at the CMWL for all the support and knowledge you have given me. Thanks to my family and coworkers to who stood by my side as I walked this journey. I love you all.